Every year we ask hundreds of green industry contractors to answer more than 60 questions about their business operations and release the results in our annual Green Industry Benchmark Report. 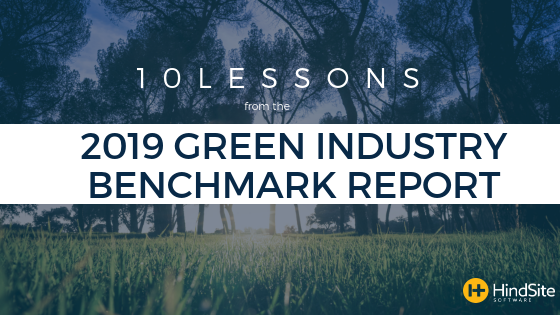 The Benchmark Report offers key insights into the practices of the typical green industry business, insights you can leverage to improve and grow your business. Green industry businesses plan to raise prices. This is something we’ve seen consistently for a couple years, and this year is no different. This year’s benchmark report found that 76% of respondents expect to raise their prices in 2019. That’s down slightly from a year ago, but still significant. When we asked for the primary reason, it’s the labor shortage rearing its ugly head again. 41% said rising labor costs were leading to price increases. A number worth watching: 11% said rising vendor costs were to blame for their increased prices. That’s up 7% from a year ago and in line with what I’ve heard from both distributors and contractors – prices are starting to fluctuate more than they have in the past, likely due to trade issues with China. If those are resolved, the fluctuating prices may as well. But if not, expect the prices for some parts to continue to fluctuate. Know Your Numbers. So what should you do? First, know your numbers. Understanding your profitability on each job is important. I’ve talked to small contractors who say they don’t really look at their profitability – they just know about how much it costs to install a 6 zone irrigation system, for example, and bid accordingly. They don’t have a ton of labor, so labor costs won’t fluctuate too much, but fluctuating vendor costs may change that dynamic. Because our green industry software solutions capture time and material, you can review a budget vs. actual report that shows how you’re doing on individual jobs, as well as by employees, customers and services. It’s an easy way to analyze your business performance so you can determine if there’s something you can do before a price increase. Examine Customer Touchpoints. There are two types of businesses that are most likely to succeed: Those that offer something unique and can offer something no other competitor can at a premium price, or those with the lowest price. If you understand your costs and are able to maximize profitability and maintain low prices, you’re in the latter category. Otherwise, to command premium prices you need to offer a premium product or service. Every customer touchpoint – from the initial phone call from a sales rep, to follow-up emails, to invoices - should promote what makes your business unique. When considering service providers, most people focus on price, unless you give a reason for them to focus on value. Get Creative. Finally, don’t be afraid to get creative if you do increase prices. If you feel like your customer base might balk at another price increase, consider offering reduced rates on long-term or pre-paid contracts. If you can sign someone up to a two year contract, it’s worth giving them the existing rate. That’s revenue you can count on. Likewise on pre-paid contracts. If customers pay at the beginning of the contract, give them a discount. You’ll probably find most will be willing to do those two things to lock in their current rate, and both improve your business – either through guaranteed revenue or better cash flow. It feels like a long time ago, but pre-Recession there were a lot of specialized businesses. Landscapers that only did design/build jobs. Irrigation guys, guys that only mowed lawns, guys that only fertilized. But, the Benchmark Report has shown a change on that front. It looks like service specialization is dying. More than half of benchmark report respondents offered irrigation, mowing/blowing, design/build or lawn fertilization, with just under 50% offering snow plowing. Just looking at those numbers, you can see that, generally, the typical business is offering a lot of green industry services. Digging a little deeper into the data we found that, on average, the typical business offered 4 of the 9 most common green industry services. As late as 2012, while the economy recovered, business owners were looking to recapture some of the revenue they’d lost as the economy declined. To do that, they were offering services to their customers that they’d not previously offered. In fact, I even heard it in one of the interviews from the Green Industry Benchmark Report. Benjamin Bodnar is basically a one-man maintenance operation. But he said he started to offer design/build jobs to some of his customers when it was a little slower in the winter (he’s near Atlanta) so he could bring in more revenue. Everyone’s looking to make more money – and keep competitors off their properties – so service diversification is going to continue to happen. Though a quick counterpoint: One of the people I interviewed for the Green Industry Benchmark Report, John Lane, predicts that things will start to swing the other way again. Because finding labor is hard – and is probably only going to get more difficult – he thinks more businesses are going to turn into boutique shops that take fewer jobs but charge more for those jobs because they have specialized skills. Time will tell. But today, it seems service specialization is shrinking, not expanding. Research. Research. Research. If you are looking to add services, first I’d recommend doing some market research. Your research could be as simple as calling a few customers and seeing if they need you to do the work that you’d like to add to your service offering. Or, you could send a survey to your customers to gauge their interest in your new service. Before charging headlong into a new service offering, collect some data – even if it’s anecdotal – that points to having success with that product. Compete vs. Collaborate? You might also want to consider whether it’s wise to compete with someone or partner with them. For example, I recently talked to a smaller customer of ours who said he gets a majority of his new irrigation install business because of a relationship with two or three landscapers in the area. Whenever they’re doing a landscape job that requires an irrigation system, they call him because they trust his work. If you can find referral partners that will allow you to grow in your core business, that might be better than building a design/build team and trying to compete with established businesses. Make some noise. If you do decide to add a new service, take every opportunity you can to promote it to your existing customers. Print up leave behinds, add it to your invoices, send it with appointment confirmations and reminders. Send a postcard. Your existing customers are going to be the easiest to sell your new service, so make sure to continually notify them that you’re offering a great new service. The most surprising result from the Benchmark Report may have been the shift in economic expectations. Recently, the majority of respondents have been optimistic about the economy and expected it to continue to grow. This year, that’s not the case. Nearly half of respondents expect the economy to stay the same, and just 31% expect it to grow. Compared to last year, when 70% expected the economy to improve, that’s a very significant decrease. 17% said they expected the economy to get worse, up 10% from a year ago. For the most part, green industry businesses aren’t expecting a recession, just more of the same economically. A quick glance at the regional expectations and a lot of economic expectation might lie with your political party affiliation. This may be an over-generalization, but folks in more Democrat-leaning areas – like New England and the Middle Atlantic, were more likely to expect the economy to worsen. Those in more Republican-leaning areas like the South Atlantic and East South Central, were more likely to expect great or moderate improvement. In our partisan political climate, economic expectations may lie with political affiliation. Eliminate debt. First, consider limiting your debt as much as possible. The less debt you have, the more flexible you’ll be in an economic downturn. Understand your customers. This may sound odd, but it’s also important to understand how loyal your customers are. The more loyal/happy they are, the more likely they are to stick with you in a downturn. We have tools that can help you do that, for example, our Connect Pro add-on automatically sends a customer satisfaction survey after jobs. If you find unhappy customers, you can take steps to make them happier. If you find happy customers, you can take steps to leverage them in your sales process through testimonials and referrals. Consider performance-based pay. Finally, think about your wage structure. We’ve talked already about how labor is difficult to find, so employers are paying more for that labor. That can be a problem if the economy tanks and business declines. Instead, consider giving raises in the form of bonuses tied to revenue growth or some other metric. That way, if revenue declines you may be able to keep some of your best employees at reasonable wages. This is part two of a three part series. Click here to read part 1. Part three will arrive soon.